Hey there! Thanks for visiting here today. 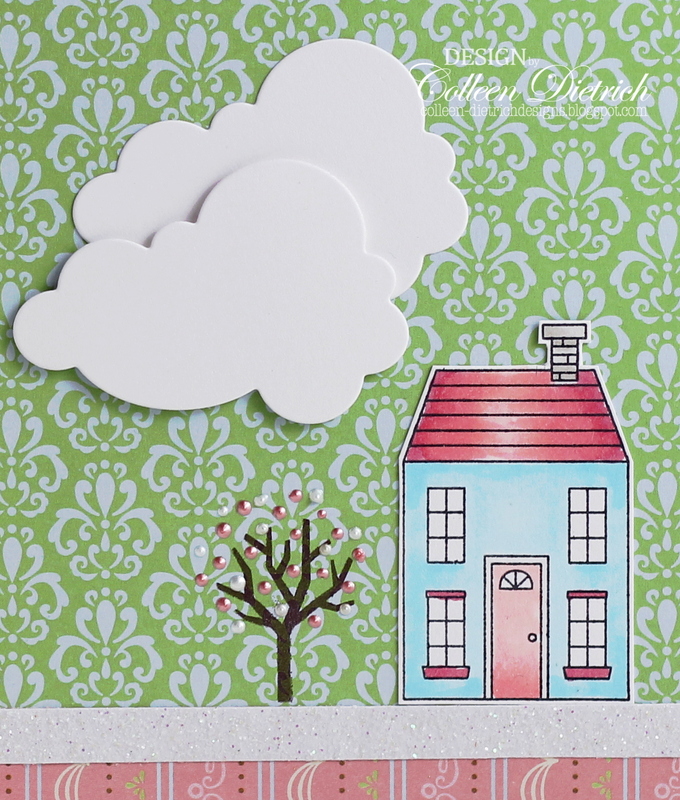 I've got a New Home card to share in springtime shades of blue, pink and green. I started with some patterned papers from my collection (I cannot remember what I used here! 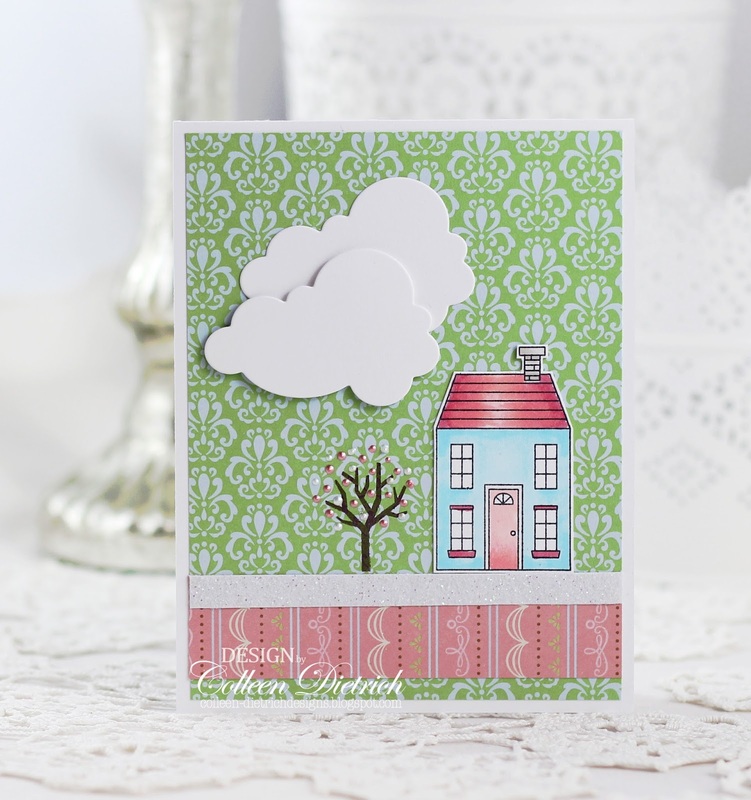 ), along with a house and tree from Stampin' Up! 's Holiday Home stamp set. The cloud dies are from Papertrey Ink. Can you see the "buds" on the tree? I used Petal Pink and White Opal Liquid Pearls. Under the house and tree there's a strip of white glittered cardstock. It was a scrap lying on the craft table, and I thought it tied in nicely with the puffy white clouds above. 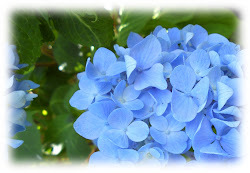 I hope you are enjoying your day! 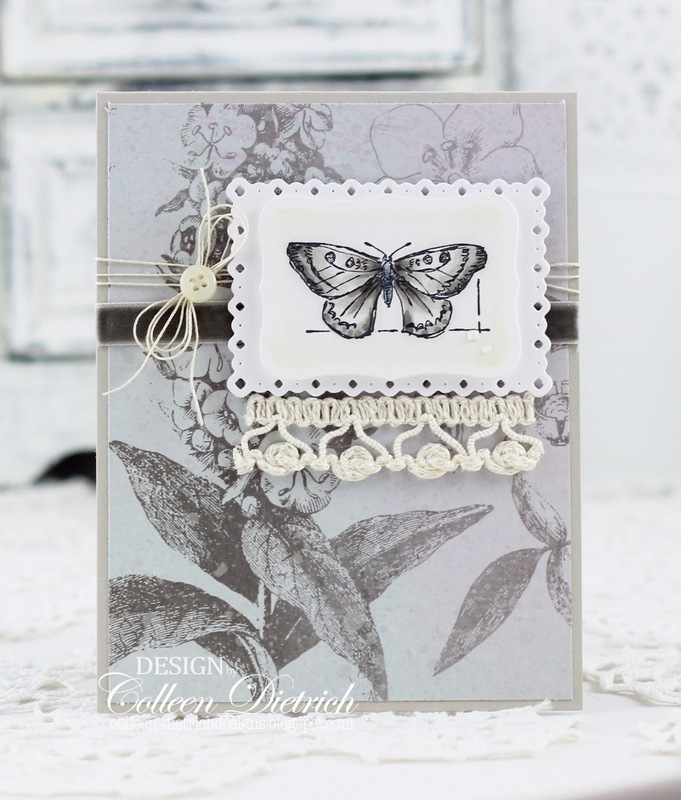 Monochromatic cards are one of my fave types to create. This one was made for a dear friend. She decorates her home with bountiful nature, rotating the decor with the season, of course. In summer, there are usually fresh flowers in vases throughout the first floor. In winter, pine boughs grace lighting fixtures, window sills, tables. In autumn, fresh gourds and pumpkins in soothing shades add ambience to the foyer and the kitchen. For her card, I chose pale, warm grays and used a butterfly (moth?) 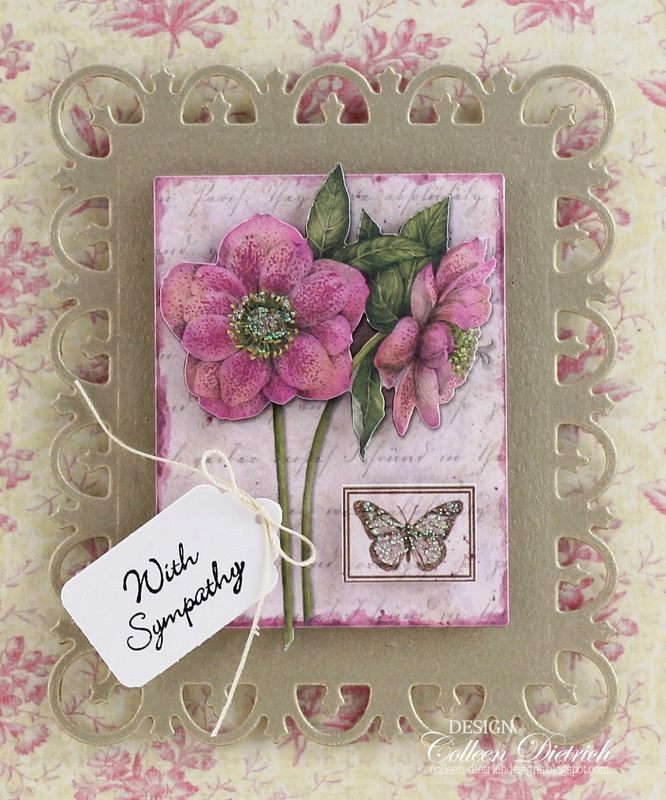 stamp from Stampin' Up! 's Natural Beauty, colored with Copic markers in shades of gray. 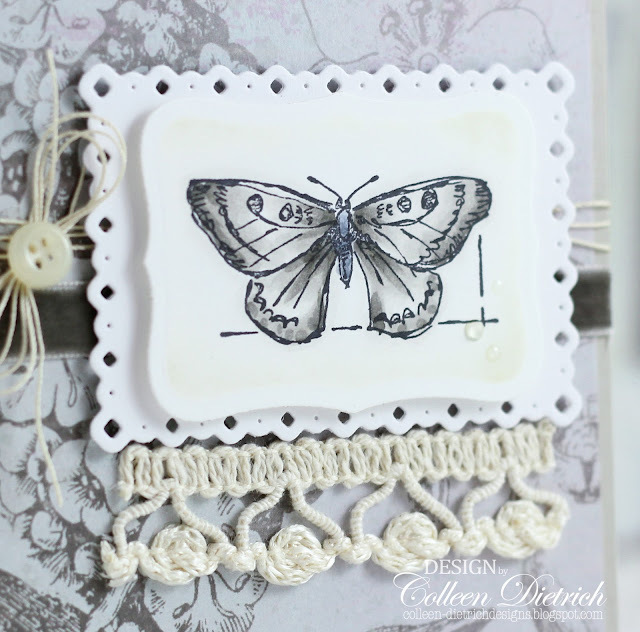 There's a strip of gray velvet ribbon (May Arts) behind the Spellbinder panels, and a snippet of cream crochet lace beneath. And of course, a bit of the plentiful vintage thread I so love to use, topped with a cream button. Wishing you a most beautiful day! Thank you for your visit! 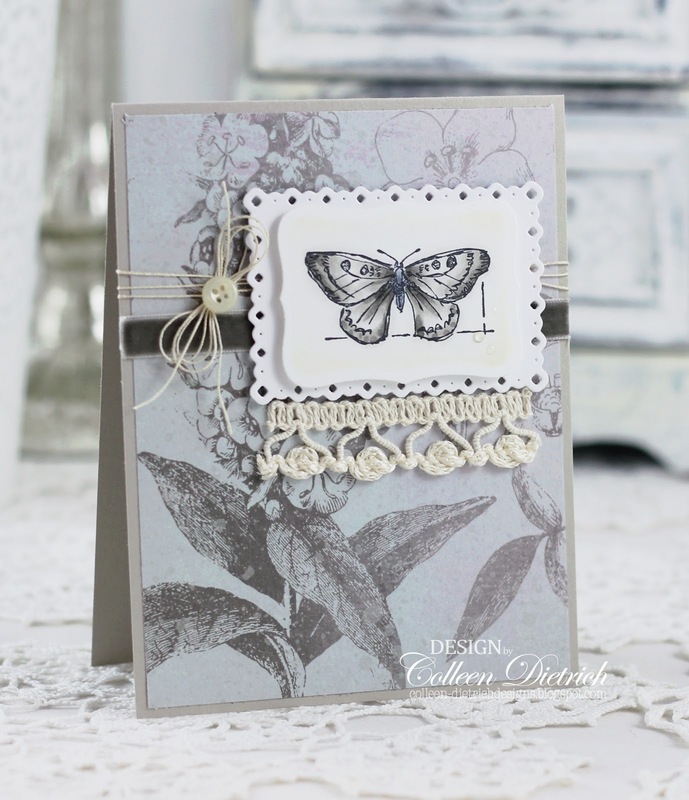 Isn't this patterned paper so lovely? It's from the K & Co. Merryweather 12 x 12 stack. And it matches this K & Co. flower sticker so well, but they were not part of the same collection. 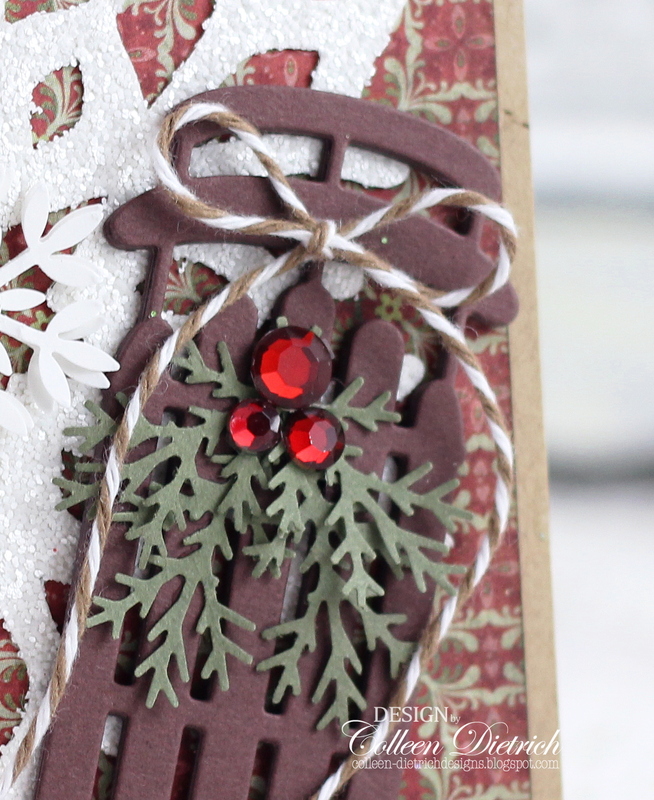 The tiny sentiment is from Stampin' Up! 's Teeny Tiny Wishes. It fit perfectly on this tag (a Martha Stewart punch), and then I tied on a vintage thread bow. I matted the floral/butterfly sticker on a Spellbinders Fleur de Lis Rectangle, die cut in shimmery gold card stock. Those K & Co. things...I think they are so lovely. It's been a while since I went shopping for their papers or their stickers, and I hope they are still in production. Last time I looked at a JoAnn store, they were nowhere in sight, not even on JoAnn.com. Thank you so much for coming by today, I truly appreciate your visit! As much as I love getting new crafting goodies, it's even more enjoyable to bring out my older things and show them some love. 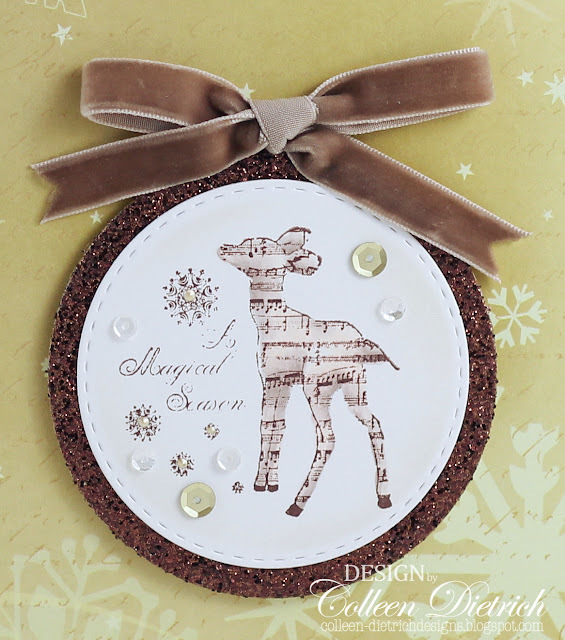 Case in point: this sweet deer stamp from Believe In Miracles / Unity Co. 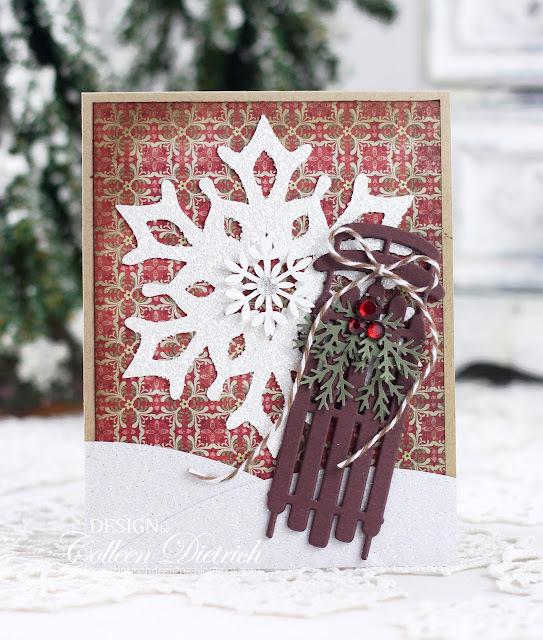 I used a Stitched Circle (Simon Says Stamp) diecut for the stamp, which includes the snowflakes and sentiment all clustered together. Then, I cut a slightly larger circle from chocolate brown glitter paper, matted the two together, and topped with a cocoa velvet bow (May Arts ribbon) and a smattering of sequins in gold and Marshmallow and sparkling clear. Forgot to mention that I did color in the deer with pale shades of Copic markers. The music notes are part of him, it's the way he was made. :-) Such a cutie. Thanks for your visit today! Happy Friday, everyone! I'm sharing a sweet, patriotic baby card that is for sale at Arts Plus Gallery. I made this with a baby shower in mind, where you don't yet know if the baby will be a boy or a girl. 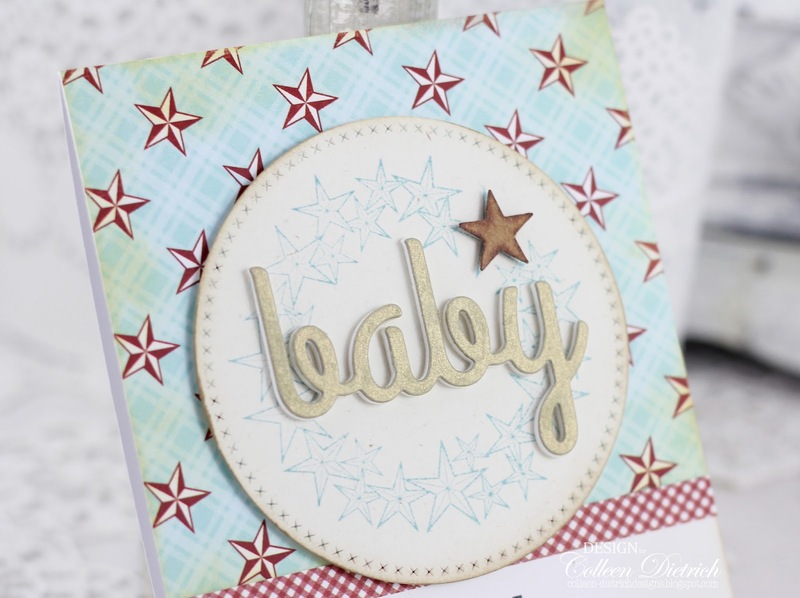 The patterned papers (stars, gingham) are from the Lily Bee Picket Fence collection. The sentiment is from Unity Twinkle, Twinkle. Love it, it's so, so sweet! I added a small kraft cardstock star to the corner of this. On the Cross Stitch Circle die cut (My Favorite Things) I stamped a DRS Designs Star Wreath in pale blue, then topped it with a sentiment die cut (Wonderful Words: Baby / Papertrey Ink) that was cut from shimmery gold cardstock, and a layer of white craft foam beneath for dimension. 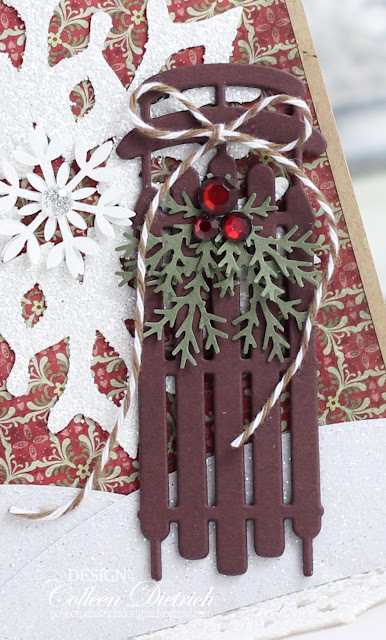 The large snowflake (Fancy Flakes / Papertrey Ink) and snow mounds (In The Meadow / Papertrey Ink) were die cut with white glitter paper. 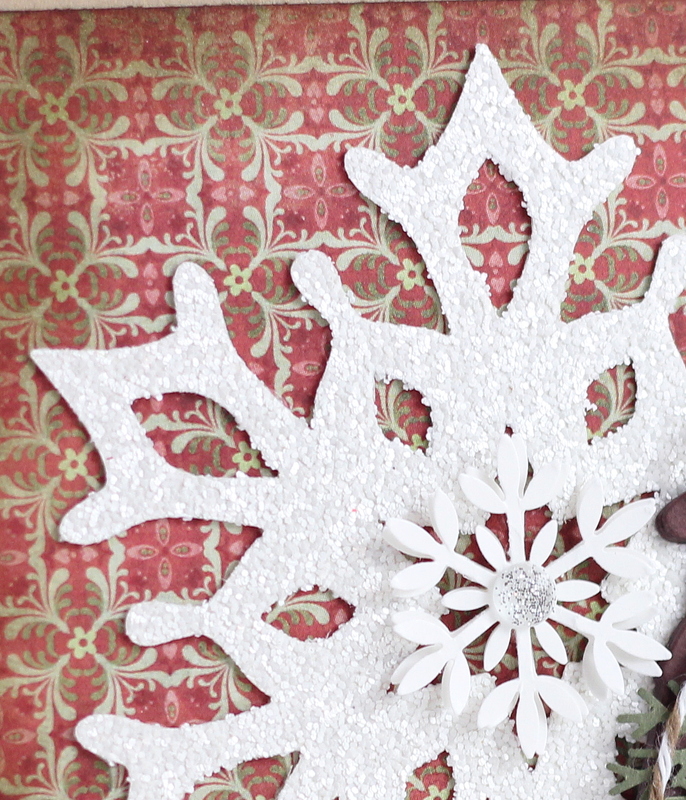 The small snowflake is a Martha Stewart Glacial Snowflake punch, topped with a clear gem. The sled (Large Winter Sled / Memory Box) was cut two or three times in cocoa cardstock for some dimension, then topped with Martha Stewart Branch Punch sprigs, a twine bow, and red gems. The weather outside is kind of warm today (high of 62) but tomorrow it should be down in the 40s for the high. That's what I like this time of year. Thanks so much for coming by today! God bless you! 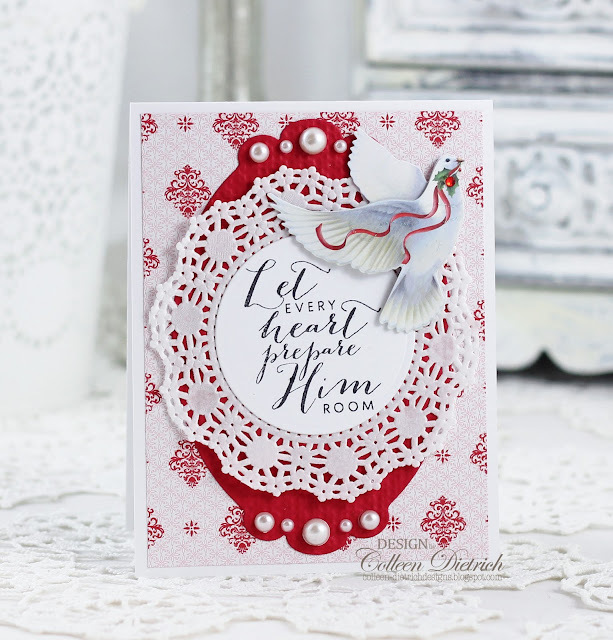 Love & Laughter - letting patterned paper do the work! Hello everyone! 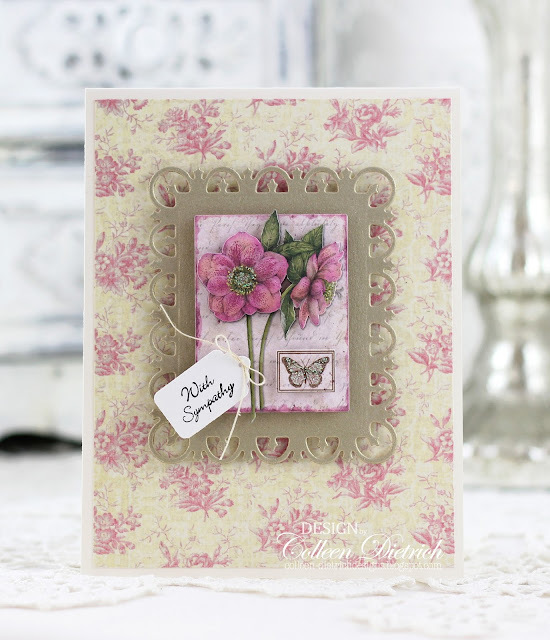 Just popping in with a quick and easy card that focuses on letting patterned paper do most of the work. That gorgeous rose patterned paper is from the Kaisercraft Lady Rose collection, a gift from a crafty friend. 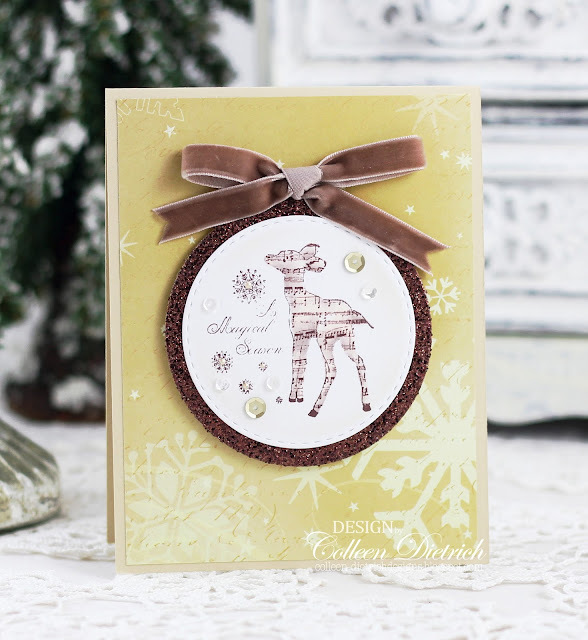 :-) I can't remember what collection the polka dotted paper is from, as I made this card more than a year ago. After adhering the polka dots to a cocoa card base, I took a 6 x 6 sheet of the rose paper and let one beautiful corner head straight down the card, sort of like the flap of an envelope. I stamped a large sentiment from Hero Arts Truly Appreciated atop the flowers. 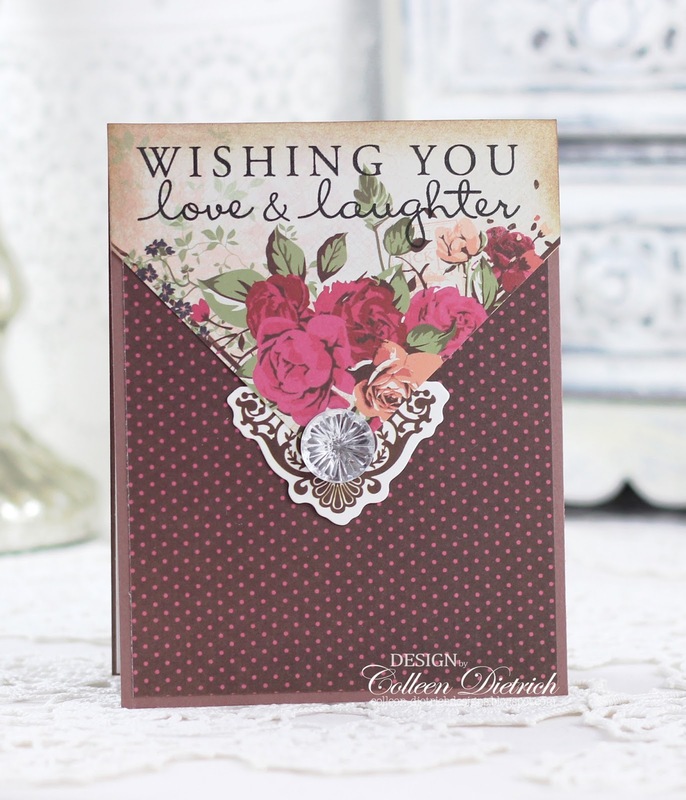 The small flourished die cut, also from the Lady Rose collection, was added under the corner, and topped with a vintage-style gem from Recollections. And that's it! What a quick card to put together. I'm going to take a look through my Webster's Pages collections with this idea in mind. Those papers have beautiful images in corners and can lend themselves well to this concept. Hello everyone! It feels more like winter outside today (read: more like February) than the 70 degree temps we had here earlier this week. Daffodils are blooming, even some cherry blossom trees are blooming and they are such a pretty sight to behold. I've got a Christmas card to share today, that had been at Arts Plus Gallery for sale this past holiday season. 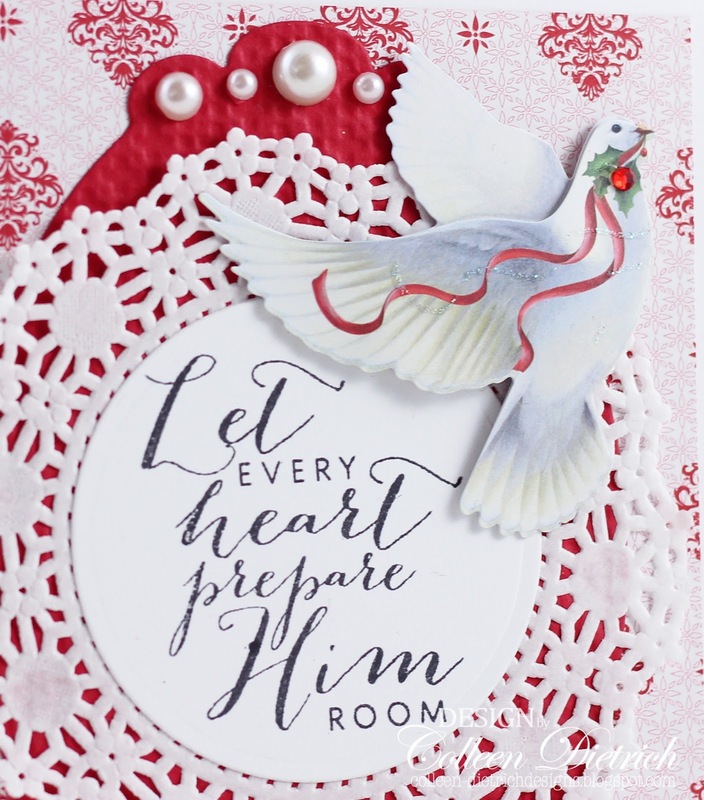 I used Verve's Every Heart stamp for the sentiment on a die cut circle, layered over a paper doily, and paired this with a beautiful dove sticker from K & Company. The damask patterned paper in the background is from a Stampin' Up! suite for Valentine's Day some years ago. 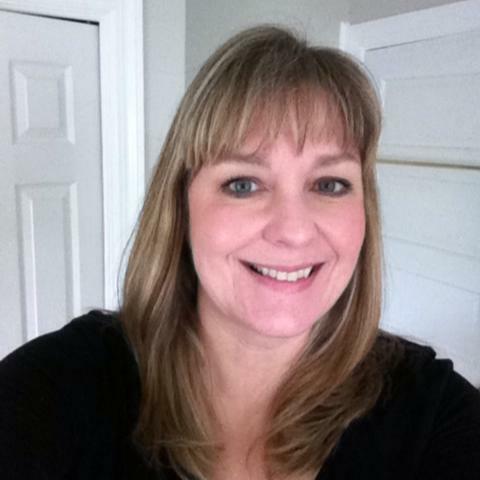 I hope you have a wonderful weekend doing something you love! Take care and be blessed!